The FIRST Robotics Competition (FRC) control system has a pair of smaller, mini-robot cousins designed and manufacturered by Innovation First, Inc. (IFI). 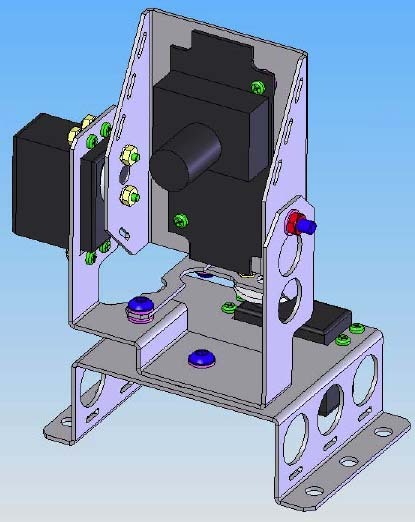 These can be used to develop software that ports quite easily to the full-sized robot controller and to prototype simple mechanical design concepts. The Vex system is the basis for a robotics competition all it's own. Most the basic principles and example code in these pages was developed and demonstrated on Edu and Vex platforms. Most years the electrical system followed this general power diagram. Differences included the use of a smart centralized power distribution panel made by IFI for a few of the years, a screw terminal power block a couple of years, the use of a grounding stud was sometimes encouraged and at other times not encouraged. +5V Power Pin	The total combined current supplied from all 16 Analog and 18 Digital +5V Power header pins is 1 Amp. The 1 Amp max can come from a single +5V Power pin. Size (W x L x H)	6" x 7" x 0.9"
AC Adapter Use the AC Adaptor IFI Model: AD48-0901500DU or DDU090150. you need to construct a switch for the OI Competition Port per this competition-port-pinout-guide.pdf. The OI and RC communicate via tether cable or by a pair of radio modems such as these. There are two (incompatible) basic types of radio modems. The same type of radio modem pairs are compatable across years and with work equally well with the 2001-2003 control systems as with the 2004-2008 control systems. One modem was only for use on the RC and the other only on the OI. The first model (an Ewave SCREAMER422) was used for the years 2001-2006 and had both blue and red lettering. Whenever two consecutive 0xFF bytes are received it is considered a packet header, and any prior bytes that were being assembled into a packet are discarded. The receiving modem then starts assembling the latest 26 byte packet. Only when a complete packet has been fully received is it sent out the receiving modem's RS-422 connection. The OI/RC software makes sure no packet has consecutive 0xFF's in the 24 byte data portion of the packet, otherwise, no complete packet will ever get through. This is why you'll never see a joystick or PWM output value of 255. Any 255's set by the user code or detected on an OI analog input are converted into 254's by the RC master processor and the OI processor instead. For Robot Control & Telemetry (FIRST), the modems are set for "RM2000" or fixed-length, 26-byte packets with no retries, therefore, no CRC check is performed on the transmitted data packets. 40 Channels. 6 channels are user selectable. 34 channels are Reserved for Competition Use Only. The second model had a different appearance and was used in 2007 & 2008. 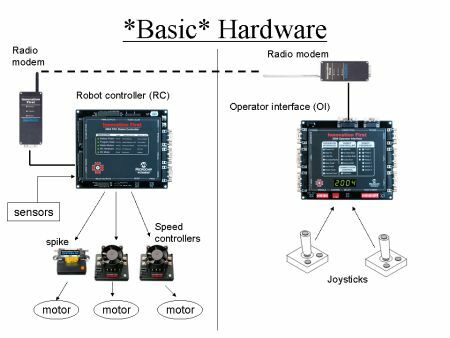 Here are the FIRST released documents, code, and support programs for the 2004-2008 robot controller (RC). The hardware for 2004-2005 is the PIC18F8520, but a Microchip PIC upgrade to the PIC18F8722 in 2006 gave us additional memory and a lovely memory bug for 2006-2008. Most documents remain valid for all the years of this controller. Some software changed when the CMU camera was added to the kit. The bug in the 2006-2008 hardware (which manifests itself by displaying the battery level as 8.2volts) required software updates to fix (see revised-frc-libraries_2-24-06 and memory_problem_8722 links below). MPLAB/C18 - search for C18 free academic version of the compiler. MPLAB the IDE is free. Teams received one EDU version of the 2004 controller to practice with. Here are pin-outs of some of the more common serial ports used in FIRST. This information has simply been cut-and-pasted from various FIRST documents and sources into one diagram. We kept referencing the wiring for these so we decided to collect it all in one place for convenience. 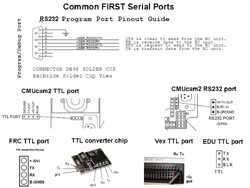 There are two basic types of serial connections that cannot be directly mixed - TTL and RS232. They are both used for serial communication, however, the TTL ports use 0 to 5 volts while RS232 uses -15 to +15v. They can be connected together only by way of a TTL-RS232 converter, one of which has been supplied as part of the annual Kit-of-Parts for a few years, and another comes as an essential part of the Vex programming kit. Here's internal documentation of the IFI TTL-RS232 ( , 16 KB) Converter for you EE's. Here is the FIRST released default code for this controller, as well as, default and example code released by mentor Kevin Watson. At the field alliance stations each Team Operator Interface plugs into an Arena Controller, one is dedicated to each team. 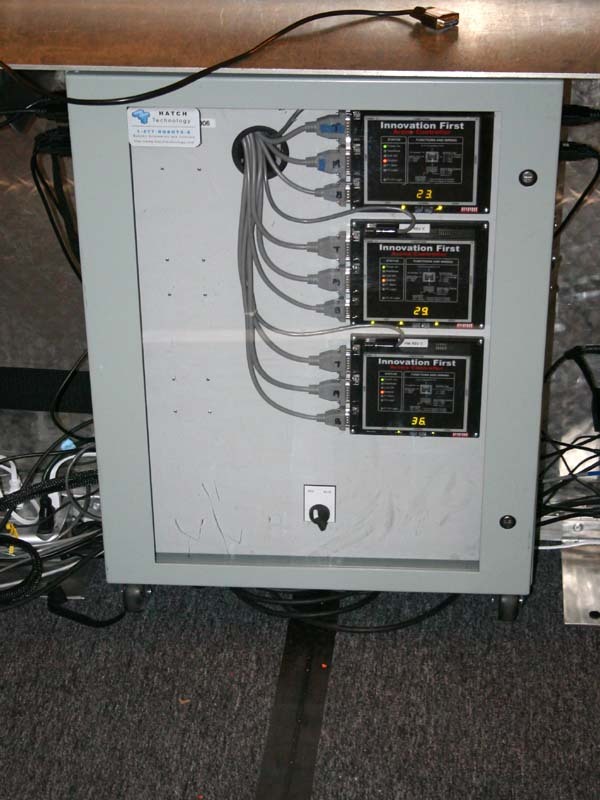 The Arena Controllers connected to the FMS control and the robot field radios (6 are grouped in a radio tree at one side of the field, one field radio per team, each given a different radio channel. This was an introduction by Tom Boehm of Patchogue Medford High School, Team 329 and Motorola Inc. to basic programming concepts in both C and the graphical programming tool EasyC. 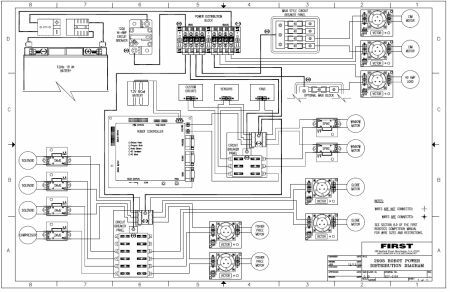 The concepts will translate over to the new 2009 control system based on C/C++ and Labview as the graphical programming tool when they are released by FIRST. The workshop was a lecture followed by hands-on programming practice using Vex robots setup with bumper sensors. EasyC is a graphical programming tool that comes donated in the KOP. It's easy to use and gets your robot up and running quickly. For more advanced operations EasyC provides the ability to insert your own native C code blocks. Some advanced operations become difficult to perform in EasyC, however, it's easy to use for beginner and intermediate programming, or for teams that just want to get something running. This introduction to EasyC was just the beginning. EasyC comes complete with a tutorial series under "Help" that provides more insight into the operation and use of EasyC. On the first Saturday after Kickoff we knew what was in the Kit-of-Parts so we reviewed new sensors/electronics, ideas for use, technical details. We covered the setup, integration, and use of the infrared remote control receiver FIRST released to us in December. The IR sensor was demonstrated on an EDU mini-robot, and we wired up and tested all the boards brought by teams. Programming workshop at Hauppauge High School in conjunction with the Hofstra University engineering department in the Fall of 2007 to introduce C, MPLAB, and how it all works on FIRST robots. An hour of lecture for beginners followed by a couple of hours hands-on programming Vex robots with a variety of integrated sensors. Experienced programmers went right to the hands-on play. Rookie programmers were started with modifying simple timed driving sequences, while the more adventuresome added sensor-based autonomous movements. Six mini-robots had a variety of sensors mounted and integrated, so the students could focus on learning how to take immediate advantage of the sensors. All robots had identical autonomous sample programs -- timed cascade, state machine, function driven, script driven, custom specialty routines. We held a Fall/Winter series of Long Island programming workshops hosted at Hauppauge High School. Vex robots were used as demonstration platforms like the previous year (with complete take-away MPLAB projects), as well as full-sized robots from past competitions (you can't take the robots away). It was basically a survey-style lecture with some demos interspersed. Not enough people brought team laptops to run a real workshop. Covered the fundamentals of FIRST robotics C programming. We covered MPLAB, basic C, FRC default code, specifics on basic robot control, debugging, common problems (it's the mechanical guy's fault), and simple loop-based autonomous dead reckoning. This is targeted for the robotics beginner who has seen C, but never used it for much. Taking a step beyond the basics we talked about and demonstrated timers, timer-based autonomous dead-reckoning, simple sensors, driving control, fixed-point math, debugging techniques. Similar to the previous year's workshop, but covering more sensors, autonomous (sensor-driven/scripting), interrupts, PID. Vex demos - encoders, ultrasonic, IR, gyroscope, CMUcam2. Anyone who wanted to stayed after the lecture and played with the demo robots. Check out the PID Control Theory ( , 38.6 KB) whitepaper our programmer Matt Krass wrote. Matt also has a whitepaper on gyroscopes ( , 55KB). It never got past the draft stage, but is a good background for the gyroscope portion of the workshop, just ignore the markups. We ran this workshop at the beginning of the 2006 season to discuss autonomous sensors in some detail. The sensors delivered in the 2006 KOP were discussed and the gyro and camera were demonstrated. Eleven teams and >60 people attended, with half-a-dozen revisiting throughout the week to work on specific programming/sensor issues. Here is the workshop presentation material and one of the simple demonstration programs for the Vex robot. The 2004 FIRST season saw the introduction of Infra-red beacons and corresponding detection sensors mounted on the competition robots. This was a workshop we ran to get other teams a real working knowledge of the technology involved and how to make it work. If you want to use the CMUCAM2 outside where the natural light swamps the camera, then you'll have better results if you place a filter over the camera lense. It can be as simple as UV sunglasses or as exact as Roscolux. With Roscolux you might even customize the wavelengths of light you are looking for, but the camera itself seems to do a pretty good job under normal conditions. The advent of a new season and the influx of new programmers-to-be cries out for a 1 or 2 page write-up on just how a programmer new to FIRST can get started. This is intended to bootstrap rookie team programmers. Sort of a how does one get started when they know absolutely nothing about where to even start programming the FIRST controller. It�s not intended to replace the IFI documentation, it�s more to direct new programmers to it. It stays away from more advanced topics like the Linux/Windows debate and configuration management. This is just to get newbies rolling. 2005 is a somewhat confusing year for software. Teams had many more choices than were available in past competitions. A team could use what they competed with last year and refine it, or they could start fresh and choose from among no fewer than three conflicting default programs released by FIRST. Only one of which is useable "out-of-the-box." MPLAB/compiler/linker produces a "hex" file version of your program to download to the Robot Controller. This hex file (with a file extension of ".hex") is based on a standard Intel 8-bit hexadecimal object file format that represents a binary file in text (ASCII) form to make it user readable, displayable, and printable. Something that can't be done with pure binary. This representation (ASCII hexadecimal) requires twice as many bytes as the binary representation.